Thompson was one of the earliest voices to join Fibber McGee and Molly, also one of the most versatile. In 1936 he moved to the show from The Breakfast Club (which had also featured the talents of Jim and Marian Jordan.) 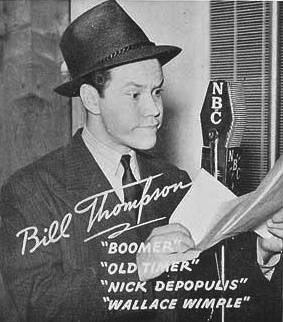 During the 1934-35 season of Breakfast Club, Thompson developed the character of Mister Wimple, using what would be later referred to as a "Droopy Dog Voice." When he first moved to Fiber McGee and Molly Thompson was called upon to play the Old Timer, a hard of hearing senior citizen in the tradition of Gabby Hayes. The Old Timer was based on Jim Jordan's character Uncle Luke from the Smackout show. The Old Timer would often bring Fibber back to earth with his catch phrase "That ain't the way I Heeard it!" Using a broad W.C. Fields imitation, Thompson also played a boisterous conman originally called Widdicomb Blotto, but later tagged as Horatio K. Boomer, who had designs on the fortune of Mrs. Abigail Uppington. Thompson also voiced Nick Depopolus, owner of the local Greek Restaurant. Thompson is best remembered for his Wallace Wimple character. Meek Mister Wimple's character focused on what might be described as reversed spousal abuse at the hands of his Sweetieface. Audiences would roll with laughter when they heard Wimple greet the McGee's with his mild "Hello folks." The character was so popular that Tex Avery would later build his famous Droopy Dog character around Thompson's voice. WWII would interrupt Thompson's career like so many others. In 1943 Bill Thompson joined the Navy. Later it would be explained that the Old Timer had joined the Seabees and that the Navy had tagged Mister Wimple to be a "Physical Culture Specialist." After a very successful career in radio and doing voice work for animation in movies and television, Thompson left show business in 1957 to pursue a career with Union Oil Company.